I love my meat but I also love vegetables!! These burgers are similar to my ever popular Beetroot, Blackbean & Feta Burgers that feature in my cookbook. Expect lots of veggies, protein from pulses like chickpeas and tons of Mediterranean flavours with sundried tomatoes, olives and fennel seeds from my Squash, Chickpea & Feta Burgers. Sweet potato or pumpkin would be great substitutes for butternut squash. Likewise any cheese can replace the feta and if you don’t like liquorice/aniseed flavours just leave out the fennel seeds and replace with freshly chopped mint or coriander. Linseed or chia would be great additions for added goodness too. 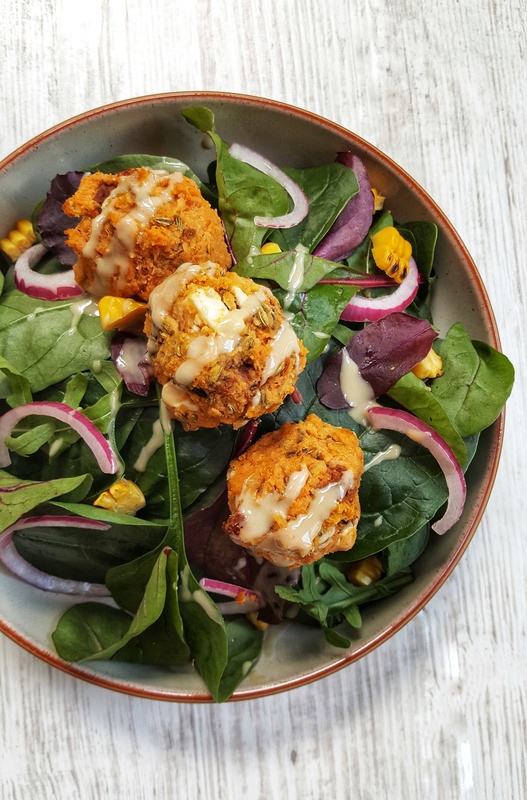 This squash burger recipe is really flexible and can be used obviously to make burgers but also falafel (just shorten the baking time by half and roll into smaller balls) or you could make veggie sausage rolls (roll the mix in flaky pastry and bake in the oven until golden). Cooked versions of these Squash Burgers will freeze perfectly for up to 3 months. Simply allow to cool fully first and wrap in parchment before placing in a resealable container in the freezer. Place the oil in a large roasting tray. Score the flesh sides of the butternut squash with a sharp knife and place skin side down on the roasting tray (roll around in the oil first). Bake in the oven for 20 minutes or until soft through. Whilst the squash is roasting, place the chickpeas in a large mixing bowl and roughly mash or lightly blitz with a food processor. Stir through the tomatoes, olives, cumin, fennel seeds and salt. Once the squash is cooked, scoop out the flesh and add to the chickpea mix. Combine all the mix together with a fork. Finally add the feta cheese and combine well together. Bake in the oven for 15-20 minutes or until golden on top.